Although it is unpleasant to think, disasters can ruin your big day. They range widely from damaged wedding gown to sudden cancellation. Therefore wedding insurance is a must for every couple. Wedding insurance covers any loss you have suffered during your wedding and so, offers you the much desired peace of mind. As you can guess, wedding insurance is a protection given to the investment of the wedding couple in situations beyond their control, and compensates the expenses incurred. Thus, if your limo driver doesn’t arrive on the day and you have to hire another limo, obviously for a heavier price, or if the venue you booked for your reception goes out of business suddenly and you have to book another one in addition to losing the deposit you paid for the previous one, or your groom loses his tailor-made tuxedo at airport, wedding insurance can help you in such monetary losses. If you choose a very basic wedding insurance, it will cover loss of dresses, rings, deposits, presents, photos and videos. This normally costs from around $155 to $550, according to the amount of coverage you desire. General liability insurance covers accidents for up to $1,000,000 and costs about $185. As soon as possible. For example, normally you pay a deposit at your wedding venue 12 months before the wedding. If it catches fire and gets completely damaged, just a few weeks before your wedding – in such a case, you will get your amount of deposit back, because of wedding insurance. However, keep in mind, that many insurance providers put limitations regarding how much beforehand you can buy insurance. 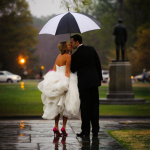 Major concerns regarding wedding are problems with venue, vendors, weather, illness or injury. Generally there is a particular maximum amount that you claim under each section, and a deductible is also applied. Read the contract carefully and understand the details of your insurance policy. Venue Problems – Check whether your wedding venue is insured already. If it’s not, wedding insurance can cover your loss arisen out of inevitable cancellation (like damage due to fire or inaccessibility due to heavy snowfall). Sometimes the rehearsal dinner site is also covered by this policy. Weather Problems – A weather condition which prevents the bride, groom or a person whose attendance is a must in the wedding, or majority of guests from accessing the premises of the wedding venue, can cause loss and it is covered by the wedding insurance. Even rescheduling of the wedding including all the details, like flowers, food, etc are covered. Vendors – The loss suffered due to any essential wedding vendor like the officiant or the caterer is also covered by the insurance policy. Illness or Injury – Illness or injury to the bride, groom or any essential person to the wedding is covered by the policy. Military or Job – Wedding insurance also covers the cancellation of wedding if the bride or groom is suddenly summoned for a military duty, or is relocated to another city by their company. Change of mind, i.e. if the bride or the groom suddenly changes her/his mind about marrying to the other, the loss incurred is not covered. Jewelry, watches, semi-precious gemstones or pearls may not be covered. Wedding rings may be covered, but engagement rings may not be covered. You can buy supplemental coverage for things like videography, photography, gifts, and even honeymoon. Your wedding day is a dream come true, and it should not be ruined in any way. However, we cannot guarantee things and so, wedding insurance is essential to at least cover the financial loss, though not emotional. So, amongst the heavy expenditure for wedding shopping, it is not unreasonable to spend a small amount for this essential thing, which can save you to a large extent.